Quinoa, pronounced keen-wah, is not a true cereal grain but rather the botanical fruit of an herb plant. It is treated in cooking as a grain. 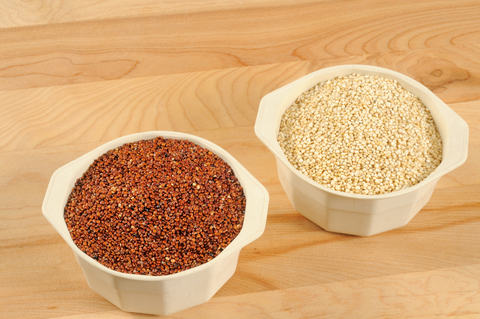 Quinoa contains more protein than any other grain. Quinoa’s protein is of an unusually high quality – it is a complete protein, with an essential amino acid balance close to ideal. Quinoa can be substituted for almost any grain in almost any recipe and is red or white. It looks and tastes great on its own or in any dish from soup to salad. Because some of the bitter saponin covering on the grain can still be present even though most quinoa is washed before being sold, you should thoroughly rinse the dry grain until the water runs clear. Combine 1/2 cup quinoa with 1 cup water and simmer for 15 minutes or until tender. Or, just bring the quinoa and water to a boil, turn off the heat, cover with a lid and forget about it! 1 cup dry quinoa/2 cups water; 1-1/2 cups dry quinoa/3 cups water and so on. For a nuttier taste, toast the quinoa in a hot, dry pan for about five minutes before cooking. After quinoa cools, mix with corn, basil leaves, red bell pepper, onion and cranberries. Mix olive oil, vinegar, and garlic – whisk well. Pour dressing over mixture and blend into salad. Season with salt and pepper. Serve over bed of chopped tomatoes and fresh greens. Garnish with raw nuts, if desire. Toast pine nuts in medium-high dry skillet – 3 minutes, remove from skillet. Put 1 T. olive oil and garlic in skillet and heat up for about two minutes and then remove from heat. To the bowl of cooked, cooled quinoa add: nuts, garlic, remaining oil, parsley, raisins, lemon juice, salt and pepper. Toss lightly – enjoy! To toast the pistachio nuts: preheat oven to 350 degrees. Arrange the nuts in single layer in small ovenproof pan and roast until you can just detect the aroma and are lightly browned, about 5 minutes. Let cool to room temperature, then chop coarsely (can be done ahead of time). To the cooled quinoa add nuts, celery, scallions and cranberries, toss together. Prepare the Vinaigrette and dress the salad. If not serving immediately, refrigerate but bring to room temperature for serving. 4 servings. More quinoa recipes will be posted in the future – try these recipes and see how you like them! Love it! I “discovered” quinoa a few years ago at a friend’s house. I’m not a big meat-eater, so I’m always looking for other protein sources. We can sometimes get quinoa flavored with spices in the supermarket, but lately all we can find is plain and I’ve been stumped on what to do with it. Thanks for the inspiration and ideas for dressing it up! Quinoa has become a staple around here – we use the white and the red. It is similar to tofu as it takes on the flavors that you put into it. Will Micah eat it?